JohnMasone.com - Yeah Conan O'Brien is great. Yeah I like him too. Yeah he's funny, now leave me along you wierdo! Yeah Conan O'Brien is great. Yeah I like him too. Yeah he's funny, now leave me along you wierdo! OK so yesterday I was thinking of actually writing Conan O'Brien a letter. His show is free but you have to wait in line to try to get in. I was going to politely ask if he could send me a pair of tickets that would somehow guarantee me seats. That way me and a friend could take the train to NYC, go see Conan, and come home all in one night. And then I watched the news today. Well that plan is out! Why? 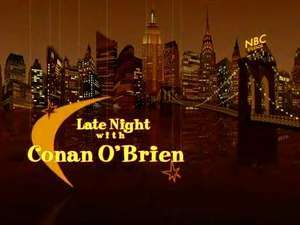 Because a Priest from, of all places, my town of Stoneham, was arrested at the NBC studios for stalking Conan. The priest was Rev. David Ajemian, and apparently lots of people in town knew the guy? St Pats is the biggest church in town. That's pretty messed up. And everyone's first response so far has been: "But Conan's not a little boy?" heh heh thats funny & true & not funny, all at the same time. I should start a MySpace group for people from Stoneham who are fans of Conan but are not stalkers.